Place pork in a shallow dish, and season with salt and pepper. Pour 1/2 cup of the vinaigrette over pork. and turn to coat. Cover and refrigerate at least 1 hour or over night. Heat grill to medium- hot. Remove pork from marinade (letting excess drip off). Discard this marinade. 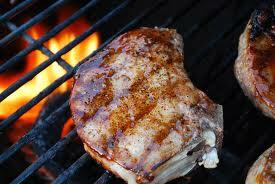 Place pork chops on grill and cook for 8 to 9 minutes turning once. Baste chops with the 1/4 cup of the reserved marinade while still on the grill. Let rest 5 minutes before serving.